Freechoice: Enjoy a guided tour of Libourne and view its quaint 16th century town-houses and Gothic church. Alternatively, explore the exclusive estate of Château Franc Mayne and taste its Grand Cru Class wine, or view the eclectic city of Bergerac and enjoy a foie gras tasting at a charming local farm. Freechoice: Travel the scenic Médoc wine route and discover why this region is viewed as the world’s leading red wine producer. Afterwards, sample the region’s finest at the Château Gruaud-Larose estate. 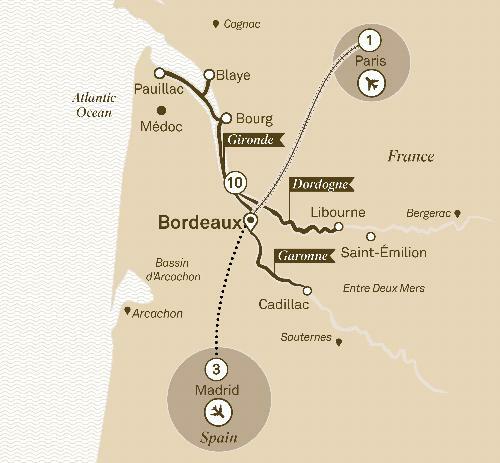 Alternatively, cycle through the region to a local château and sample delicious wine produced on the estate. Freechoice: This morning, venture into the Sauternes region for a tasting of the prestigious Château Guiraud dessert wines. Alternatively, cycle through the rolling vineyards of Sauternes to the Grand Cru Class estate of Château Myrat for a tasting. Freechoice: Shop with a Chef at a local food market and cook up a storm in Scenic Culinaire afterwards (seasonal option, will be replaced with panoramic city tour when not available). Or, enjoy a guided tour of Bordeaux and her many attractions. For the more energetic, cycle the historic regions of Bordeaux. Cross beautiful bridges to witness sites such as the Royal Gate and the Palais Rohan, before cycling through public gardens back to the luxury of your floating hotel. Freechoice: Journey to Arcachon and join a walking tour including a visit to the local Baltard market. Or climb Europe’s largest sand dune and take in the expansive panoramas. Alternatively, stay in Bordeaux and take a local tram to the Cité du Vin museum and enjoy an interactive journey of wine discovery. This afternoon, if you fancy something sweet, stay on board and enjoy a fabulous Mademoiselle de Margaux chocolate and wine-pairing event. Freechoice: Stroll through the charming Citadel of Blaye, or take a more active walk throughout the town. Alternatively, join a 30 kilometre roundtrip cycle along the Captain’s Road which is named in honour of the WWI Captains who chose to purchase their homes along this beautiful stretch of waterway in the early 20th century.